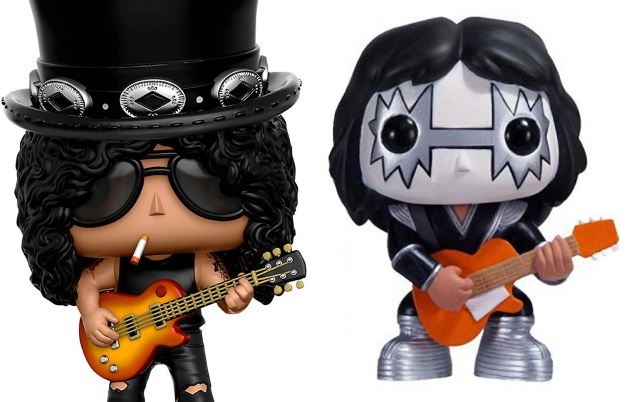 According to Law360, guitar maker Gibson has filed a lawsuit against Funko, the manufacturer of the popular vinyl toy line Funko POP, claiming that some of its guitar designs were used without permission. The suit, which was filed late last week in California federal court, alleges "repeated" unauthorized use of its company's guitar designs in Funko figures, including those based on the likenesses Slash (GUNS N' ROSES), Ace Frehley (KISS), Paul Stanley (KISS), Kirk Hammett (METALLICA) and James Hetfield (METALLICA). Gibson, which has trademarked the shapes of a number of guitars, claims to have contacted Funko in October with an offer of entering into a retroactive licensing agreement, but those discussions were unsuccessful. Gibson wrote in the complaint: "The misuse of the Gibson trademarks by Funko was intended to cause, has caused, and is likely to continue to cause, consumer confusion, mistake or deception including the misleading of consumers into mistakenly believing that the defendant's unauthorized products are made directly by Gibson pursuant to Gibson's strict quality control standards or Gibson has authorized or licensed the use by Funko of the Gibson trademarks for those products." Funko is the brainchild of Brian Mariotti, who bought the company with an investor group in 2005. It is is part-owned by private-equity firm Acon Investments.